Feng shui can help you achieve great results in many ways. The feng shui cures, or remedies, you apply in your home are as efficient when you choose a meaningful decor item from your own culture, as they are if you go with a traditional Chinese item. However, if you are interested in popular classical feng shui products and would like to gift yourself (or your friends!) with some traditional feng shui gifts, then check these products to make the shopping of feng shui cures easy for you. Be sure to also find out the meaning of most popular classical feng shui symbols to make the best choice. There are many uses for these good luck red envelopes in feng shui. No matter which feng shui school of thought you practice, you can always use these red envelopes as an abundance feng shui cure (filled with crystals, coins, etc.) or as a hidden energy activator for any area of the Bagua that needs a little extra help. The feng shui Chinese symbol of double happiness is a popular classical feng shui cure to attract and strengthen the energy of love & marriage. This feng shui symbol has the energy of perfect harmony and balance between two people and is often used in the Southwest area of a home. If you are following the annual feng shui updates, you can also use this cure in the current location of the Romance star. The coins used as feng shui money cures are the round Chinese coins with a square hole in the center. These coins are replicas of ancient Chinese coins, made from bronze or brass and come in two finishes: a weathered, antique look or a shiny gold surface. The most common use of Chinese coins in feng shui is for money. The other popular use of coins in feng shui is as protection and good luck cure. There is a common confusion in feng shui as to which plant exactly is considered the feng shui money plant. Added to the confusion is the fact that you can also call a feng shui money plant the feng shui product that has many Chinese coins "growing" on a tree, also known as the gem tree. This plant is for sure the popular classical feng shui money plant. Who says money doesn't grow on trees? It does. At least in this popular traditional feng shui wealth cure. The meaning of the cure is obvious - may your money keep growing easily and effortlessly, just like the fruits of a good tree! Read feng shui tips for the use of Chinese Coins. Even though a very popular feng shui item, the bagua mirror is not a decor item and should be used with caution. First, it should never be used indoors. Second, use it only if there is bad feng shui energy - Sha Chi or Si Chi - facing your home or business. In feng shui, the Dragon is one of the four celestial animals and the most auspicious symbol to have in a home. Having a dragon in any part of your home is considered beneficial as long as the Dragon is treated with respect. Being a symbol of strong yang/male energy, this can be a good feng shui gift for an important male figure in your life. Not only is this Buddha holding an ingot, but he is also made from Jade, a very popular crystal in feng shui applications. A symbol of prosperity and good fortune, thus a good feng shui cure for wealth, this Jade Buddha is a good gift for anyone interested in feng shui. 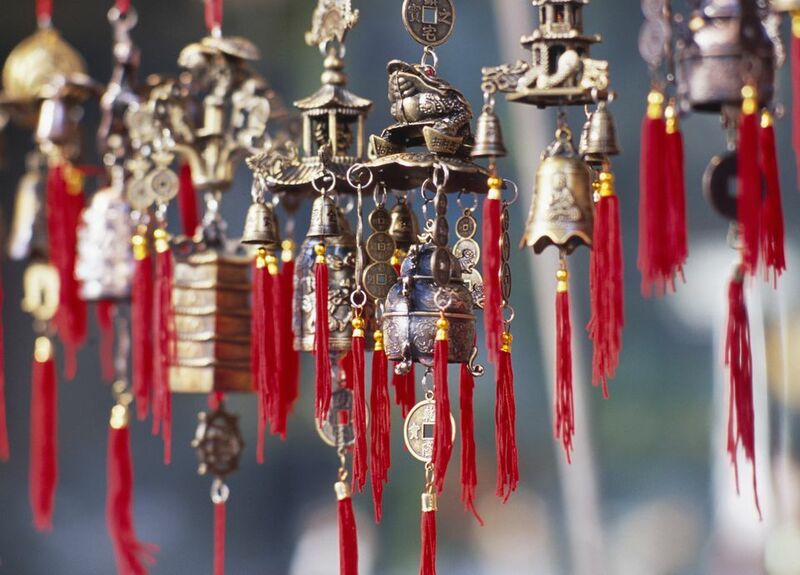 Chimes have many applications in feng shui. Even though we think the best use of wind chimes is outside the home, we know wind chimes have become a popular feng shui indoor cure. No matter you use it in your home or garden, this attractive metal chime with a half-moon wood base and Chinese coins can be an excellent feng shui money cure. One of the most popular feng shui cures with many applications; the Wu Lou has many uses for a feng shui enthusiast - from a feng shui money cure to good luck and long life symbol. Most commonly the gourd is made of either metal or wood, but you can also find a wu lou made from jade, porcelain or even glass. I am sure you have heard about the feng shui of Mandarin ducks many times. The Mandarin ducks mate for life, which made them one of the longest feng shui love symbols and a popular feng shui cure for lasting love and marriage. Always display them in two (of course! ), and be sure you like them. The dragon head turtle is a classical feng shui cure for attracting wealth and abundance. A mythical creature with the head of the dragon and the body of a turtle, it sits on top of a load of coins and has a little one on its back. Stability, wealth and a good foundation that will benefit the generations to come - this is the meaning of the feng shui dragon turtle cure. Fu (Foo) Dogs are a very popular feng shui protection cure. Traditionally used as guardians of wealthy homes, they are also often used inside in the traditional feng shui applications. This specific Fu Dogs couple can be a good gift for anyone working on developing his or her career and can be placed in the office looking out the office door. The three-legged money frog is probably the most popular feng shui money cure. Holding onto many coins and ingots, this mythical creature is considered to be an excellent family money guardian and can often be found in Chinese homes. The Laughing Buddha is a very popular feng shui symbol used in many decor accessories. This symbol adds a happy note to any space and creates a vibrant and auspicious feng shui energy.